Heart disease is considered the leading cause of death in the U.S., and hypercholesterolemia is a major contributor to the issue. You probably know it simply as high cholesterol. Approximately 17% of adults have high cholesterol. That’s one in every six adults! And you wouldn’t know it either, unless you had regular blood tests. This is serious because your low-density lipoprotein (LDL) and very low-density lipoprotein (VLDL) cholesterol levels (generally known as “bad” cholesterol) may harden your arteries and could silently put you at risk for a stroke or heart attack. When your blood tests reveal consistently high levels of LDL and overall cholesterol, your doctor will likely prescribe a commonly known anti-cholesterol drug, statins. About one in every four Americans uses statins. However, statins aren’t everything they seem. They are known to lower the amount of cholesterol produced by the liver, but there are side effects as well. Some of these may include nausea, headaches, and general weakness and muscle pain, while other side effects can be more serious, such as diabetes, the skeletal muscle condition rhabdomyolysis, or liver failure. 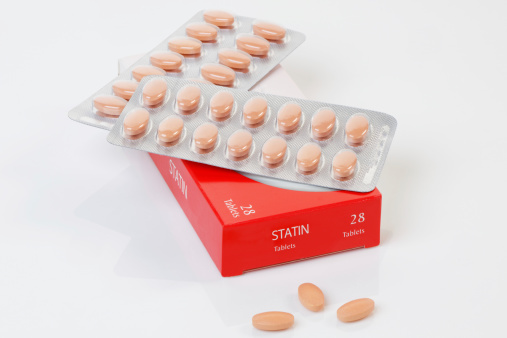 Some research suggests statin drugs may reduce the risk of certain cancers, such as colorectal, skin, and prostate cancers. However, there are contradictory studies that show statins may actually cause certain cancers. In fact, I’ve come across a couple of studies published this year in the journal Clinical Endocrinology that reveal statin drugs may cause thyroid cancer in women. The first study published in July was case-controlled and sourced from the Taiwan Longitudinal Health Insurance Database 2000. It observed 500 thyroid cancer patients and 2,500 people without the disease. Thyroid cancer was associated with any past use of statin drugs, and the issue was only prevalent in women. The researchers hypothesized that the statins only affected women because of the presence of a form of estrogen, estradoil, which is a common hormone in females. The second case-controlled study was published earlier this month, and it found that thyroid cancer would form in women from the immunosuppressive properties within statins. The thyroid cancer risks of statin drugs don’t stop there. A report published in the Journal of the Tennessee Medical Association in 2000 noted that, after being on simvastin for three months, a patient would develop follicular adenoma with prominent Hurthle cell changes. There were no side effects from a year of pravastatin therapy. The report suggested that senior women with hyperlipidemia should not use statins to treat the cardiovascular disease. What about the cancers statins are believed to help? Well, in a case-controlled study from Taiwan, published in the journal The Prostate in 2011, statin drugs were found to increase the risk of prostate cancer. The study observed people above the age of 50 who were diagnosed with prostate cancer for the first time between 2005 and 2008. There were 388 prostate cancer patients observed, as well as 1,552 controlled cases. Statins were found to significantly increase the risk of prostate cancer compared with the patients who didn’t use statins. There has to be a better way to reduce cholesterol than statin drugs, especially when there is a life-threatening side effect like cancer. Lifestyle changes are the first place to start. It is best to quit smoking, get regular exercise, and increase your intake of vegetables and dietary fiber. Foods such as wild pacific salmon, nuts, oats, and beans can help reduce cholesterol. Yoga and meditation can help with stress reduction, which can also lower cholesterol levels. Finally, niacin (vitamin B3), plant sterols and stanols, pantethine (the active form of vitamin B5), and garlic are all natural supplements that can also help lower cholesterol and your risk of cardiovascular disease. Hung, S.H., et al., “Statin Use and Thyroid Cancer: A Population-Based Case-Control Study,” Clinical Endocrinology July 30, 2014, doi: 10.1111/cen.12570. Mascitelli, L., et al., “Statin immunomodulation and thyroid cancer,” Clinical Endocrinology September 1, 2014, doi: 10.111/cen.12600. Ji, S., “Statin Drugs Linked to Thyroid Cancer in Women,” GreenMedInfo web site, September 14, 2014; http://www.greenmedinfo.com/blog/statin-drugs-linked-thyroid-cancer-women. McCord, E.L., et al., “Development of thyroid follicular adenoma on simvastatin therapy,” Journal of the Tennessee Medical Association June 2000; 93(6): 210–212. Chang, C.C., “Statins increase the risk of prostate cancer: a population-based case-control study,” The Prostate December 2011; 71(16): 1818–1824, doi: 10.1002/pros.21401. Murray, M., et al., The Encyclopedia of Natural Medicine (New York: Atria Paperback, 2012), 680–691. “Statins and Prostate Cancer,” Prostate Cancer Foundation web site, March 4, 2014; http://www.pcf.org/site/c.leJRIROrEpH/b.9018409/k.9DA2/Statins_and_Prostate_Cancer.htm. “Frequently Asked Questions (FAQs) About High Blood Cholesterol,” Centers for Disease Control and Prevention web site; http://www.cdc.gov/cholesterol/faqs.htm, last accessed September 25, 2014. “What is cholesterol? What causes high cholesterol?” Medical News Today web site; http://www.medicalnewstoday.com/articles/9152.php, last updated September 3, 2014.